Phone mounts are a blessing when driving. They allow you to legally use your phone on the move, accessing music, phone functions or navigation. With a wireless car charger, you can achieve all of this while simultaneously charging your device and doing away with the complicated wiring that clutters your dashboard. 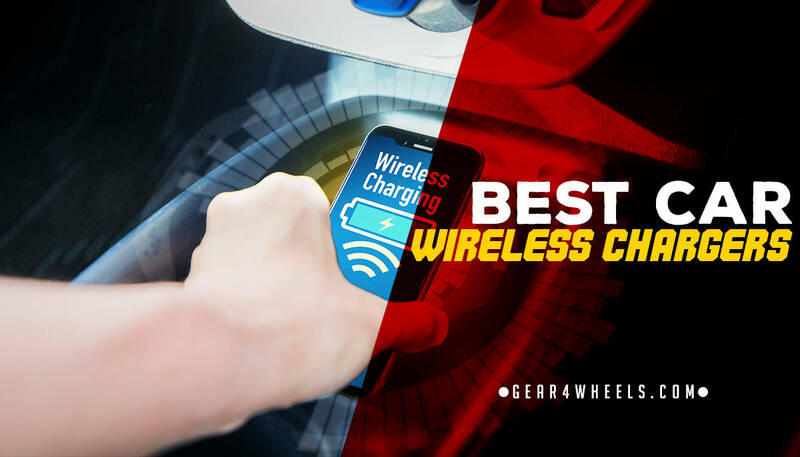 Below, we’ve looked at some of the top wireless chargers you can get for your car. This is the most expensive of the products we'll look at, though that's understandable given that it is a premium product from the premium maker, Samsung. 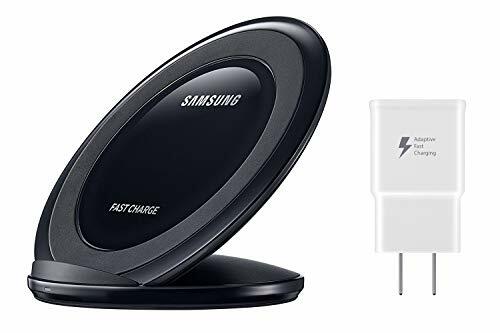 In a range of 5 unique colors, the Samsung Qi is a certified wireless charger for Android phones. It features a Fast Charge feature that should get you to full power in approximately 2 hours, and a multicolored LED that indicates charging status. It's also cross-platform, supporting both Samsung Android handsets and i-Phones. Since this charger uses magnets to hold your phone in place, rather than using cables or clamps, you can affix your phone to the face plate in either portrait or landscape orientation. This means charging your phone on the move, as well as using satellite navigation, without having to handle it while driving. It’s also super-easy to fold down into a smaller footprint when traveling. Since this is a Samsung product, you won’t have to worry about unsafe or low-quality components. Phones affixed to this charger tend to heat up over time, unlike most traditional cable-based chargers that don’t seem to have the same effect. The LED light that indicates when a phone is charging can also be quite bright, which can be a distraction when driving, or if using the stand by a bedside. You’ll also have to very specific about the placement of your device to ensure that it picks up the charge. 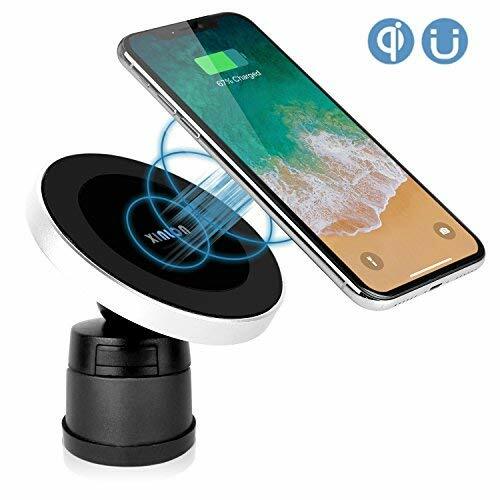 The SCOSCHE WDQM Qi-Certified Wireless Charging phone holder uses the traditional suction cup-based design to secure your phone while driving, though it has been upgraded with wireless charging support for the 21st Century. 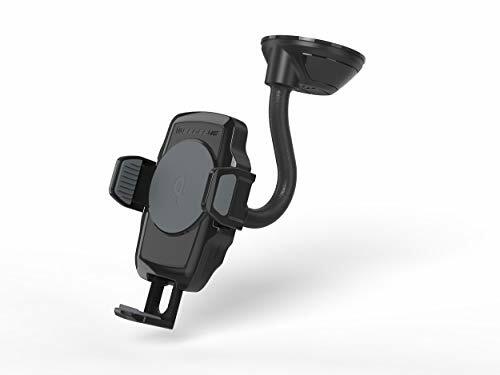 This in-car phone holder looks like many of the more traditional, lower-tech models you're used to; however, it's Qi-certified for using with any devices that support this feature. It also has a one-touch push button that quickly locks and unlocks your phone. This phone holder model offers complete stability when driving and shouldn’t move or bounce around. The clamps are secure and will hold the phone tightly in place, whether using it in portrait or landscape position, and the inclusion of a landscape mode is perfect for GPS applications. You can even fit some tablets and GPS hardware into the holder with the adjustable arms, up to 3.5-inches. Though suction cup designs are very stable for road use, they do have the drawback of marking your interior windscreen glass when removed. A unique problem introduced to this design by the adjustable clamps is that you may need to adjust them several times over until you find the charging sweet spot for your specific phone model. The XINLON charger from Tankship is a reasonably-priced, mid-range product that offers support for a range of phones, up to and including the iPhone X and Samsung S8, Galaxy S8, and S8 Plus. This holder features a single attachment that functions for both vent and dashboard, when adjusted, as well as having a reasonably long warranty, which is a nice addition. It supports any devices that are capable of wireless charging, though the heavier the model, the more strain you’ll have to place on the adhesive base. 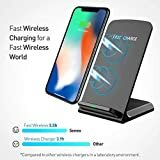 Though it isn’t the fastest wireless charger, phones do charge easily and hold onto it, even in the face of bumps and turns in the road. There’s also an attachment for vents, increasing the options as to where you can secure the holder. For some reason, this product chooses to incorporate adhesive pads into the base design instead of purely using magnets, which provides a weaker connection and one that is likely to degrade, fast. The instructions are written poorly, though that’s a minor concern, and the speed of charge is slower than brand-leaders. 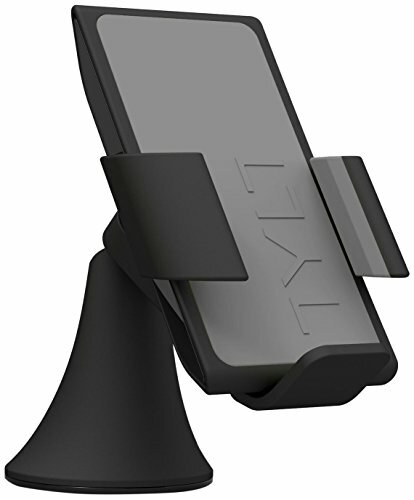 The TYLT VU Wireless Charging Cat Mount is an expensive option, albeit one that doesn't support quite the same range of phones as competitor products. We've chosen this one simply for the impressive aesthetics. 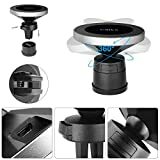 This phone holder features a Micro-Gel suction cup that promises strong suction to any solid surface, as well as a supplementary charging port that plugs straight into the cigarette lighter for a second phone. It supports viewing in either portrait or landscape. One thing to like about this model is the stylish design; whereas many chargers go for a metallic appearance, this one is crafted from matte materials and will fit in well with any dash other car interior. It also comes with a supplementary 1 Amp USB port for charging a second device. Though the base’s ability to stick to a wide variety of solid surfaces is impressive, it lacks a vent attachment and can’t support thick cases very well. It’s also seemingly not compatible with many newer models of handsets, putting it instantly out of date and behind competing products. 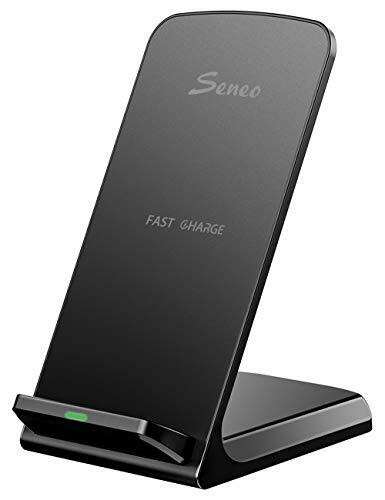 The Seneo Standard Wireless Charger is a model from the budget end of the market, offering support for a range of cross-platform phones, including the most recent handsets from Samsung and Apple. This case comes in just 2 separate colors, but the shape and design have a lot to like; as a portrait-oriented rectangle, there’s no obtrusions around either side of the phone when it is placed in the mount. This keeps it minimalist when on your desk, so that your phone screen plus the charging indicator are the only things you can see. Though you’ll have to charge larger handsets on their side, achieving a good connection to the charge isn’t as tricky with this model as it is with some others. 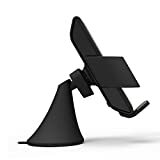 It’ll also connect through most phone cases and sits at the perfect angle for hands-free use on a desk or bedside table, too. Like the Samsung model we’ve looked at above, this charger features a very bright LED when your handset is charging. This can be distracting and make it more difficult to sleep in a dark room, where the effect is amplified. 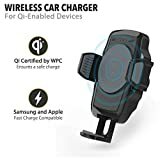 It’s not the most ideal charger for car use, as it’s not particularly stable in transit, and the wireless charging is slower than competitors; perhaps this is to be expected from the price. For us, the clear winner among this category of wireless in-car phone chargers is the Samsung Qi Certified. When it comes to something as important as phone-based tech, you can’t do much better than sticking with the big, trustworthy brands. With Samsung, you know you’re getting a product that’s built from quality components and one that will last.